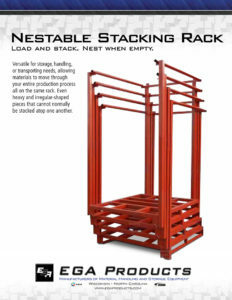 Nestable Stacking Racks | EGA Products, Inc.
EGA Products is proud to design and build high-quality American made stacking rack systems. 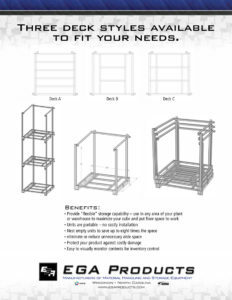 EGA custom builds racks to meet customer demands for all kinds of adaptable storage, while also offering three common deck styles in their extensive material handling catalog. Inquire today, and we’ll work with you to get the best stacking rack solution on the market – defined by you. At EGA Products, hiring the best welders, machinists, and skilled tradesmen – here in America – has paid off. In a world dominated by importers, EGA has held its own because it doubled down on a strategy to offer completely American Made stacking rack solutions. Why? It matters to EGA, and it matters even more to their customers. Customers of EGA know they’re buying handcrafted goods they can count on, because at EGA having an eye for the best craftsmanship in the world is why EGA is still going strong today. The staff at EGA Products is always very friendly, efficient, and helpful. The turnaround time on our orders is quick and always on time! 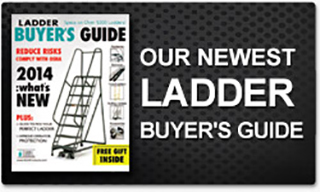 EGA Products is an industry-leading manufacturer and distributor of rolling ladders, work platforms, shipping racks, safety and swing gates, and more material handling and custom fabrication equipment.